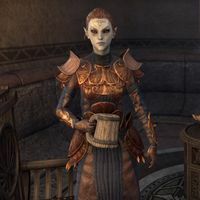 Nara Varam is a Dunmer who can be found in the Saint Olms Waistworks in Vivec City. She sits in the southeast corner of the central plaza and drinks from a mug. Nara is the former apprentice of Dubdil Alar. "I've left the tower, yet I keep having the same dreams." "Are you here about my request? We have to fix this, before it's too late." I'm here about Dubdil Alar. "I know all your clients have burdens to bear, but I'm speaking of the very fabric of Nirn here. Master Alar plans to perform an experiment that will alter the laws of our reality, and I need you to stop it. I require his research notes as well." What exactly is his experiment? "His calculations have grown incomprehensible to me, his theories turned to ramblings. But I know what he plans to do goes against nature itself. There's no predicting the chaos his success may bring. We have to stop him before it's too late." Can you tell me more about Dubdil Alar? "I respected him. He was brilliant, always looking at all the possibilities, at the entirety of our existence. But he's discovered something dangerous, and I have a feeling someone led him down that dark path. His notes may tell me who." Why do you need his research notes if I'm going to stop the experiment? "We must prepare for the worst. Magic has long lingering and far-reaching effects. Perhaps Master Alar can find reason and stop this experiment, but if he cannot then it falls to me to fix his mistakes. His notes will help me do that." "What happened? Were you able to stop him?" If Dubdil Alar lives: I was able to stop Dubdil Alar and gather his research notes. "I'm grateful that we were able to solve this through peaceful measures. I'll start my research on his notes straight away. I'm sure to find some clue about how he came about this knowledge in the first place." If Dubdil Alar perished: I stopped the experiment and gathered research notes. Dubdil Alar didn't survive. "I'm sure you did all that you could. We have to be grateful for what we have saved, not for what we have lost. I'll begin my research on his notes to see what damage his magic may have caused. I thank you for your service." "I don't understand. You stopped the experiment. Why do these visions remain?" This page was last modified on 9 February 2019, at 17:39.